We told you about how flaxseed oil is really great for your overall health. But did you know that the oil works wonders on your skin too? Flaxseeds are rich in omega-3 fatty acids and other vital nutrients which not just promote great health but keep the skin glowing too! No wonder that skin care with flaxseed oil is slowly gaining popularity. We don’t want you to be left behind in reaping the benefits. So here is a quick guide to tell you how flaxseed oil can help your skin and how to use it. Flaxseed oil is loaded with omega-3 fatty acids which help in keeping the skin tone even. Being the good fats that they are, the omega-3 fatty acids add the requisite amount of moisture to the skin, without making it too oily. Regular use can delay the onset of fine lines and wrinkles in the face. Flaxseeds have for long been consumed to reduce inflammation in the body. The same way, the oil can bring down inflammation in the skin. You can use it to treat rashes and eczema and also apply it on acne affected areas. This property of flaxseed oil also comes handy in healing sunburns. It is non-comedogenic. In fact, flaxseed oil helps in unclogging the pores. Combine that with its anti-inflammatory properties and you have your solution to cure the acne on the skin. Flaxseed oil is also said to thin down the sebum in the skin. This means that regular massage with the oil will keep your skin shine-free for longer hours. The most important point here is that flaxseed oil is completely natural and edible. So if you want to treat your skin to some natural goodness, then it is among the best options there is to pamper your skin. 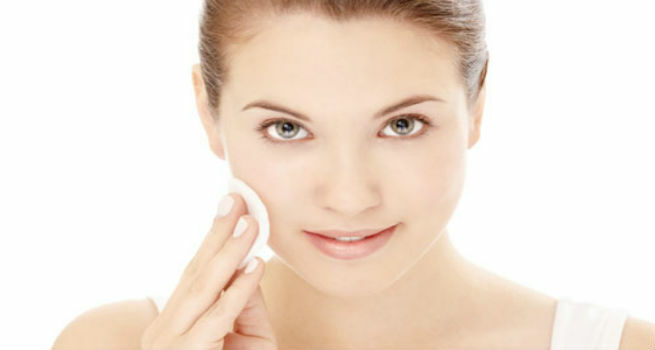 Cleansing – Since the oil helps in thinning sebum and unclogging pores, the best way to use it is for cleansing. Steam your face to open up the pores. Now massage a few drops of the oil on the skin in circular motions. Cover your face with a warm towel for a minute. Now wipe off the oil from the skin with a cotton ball. This oil-cleansing method will help cleanse your face and keep your pores clean. Massage – Take a few drops of flaxseed oil and mix it with your favorite essential oil. Massage it well on the skin in the night. This will help tone the skin up. In fact, you can skip your night cream if you use this. The oil will help rejuvenate your skin while you get your night’s sleep. Your skin will be smoother and fuller with regular use. As a moisturizer – You can smooth on some flaxseed oil on the skin soon after your bath. This will help lock in the moisture in the skin and will keep it soft and supple. It also is known to provide protection against the sun. Post Sun care – Rub some flaxseed oil on the skin after you get back from an outing in the sun to soothe the skin. In body scrubs – You can replace coconut oil or olive oil in our DIY Body scrub recipes with flaxseed oil to get glowing skin. Flaxseed oil can get rancid very soon once the bottle is opened. So always buy it in small quantities and refrigerate the oil after opening it. Flaxseed oil is packed with nutrients and is great for your health as well as your skin. Try these methods of skin care with flaxseed oil and tell us how your skin responds to them.